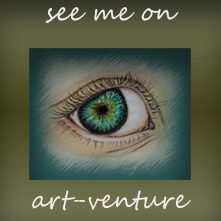 Today my painting dedicated to one of my old friend on Steemit, who I met very incidentally, his digital Art caught my eye and inspired me to write what I see when I look at it, from that very moment till now almost one year he is a friend who was brought by this amazing blockchain Steemit. 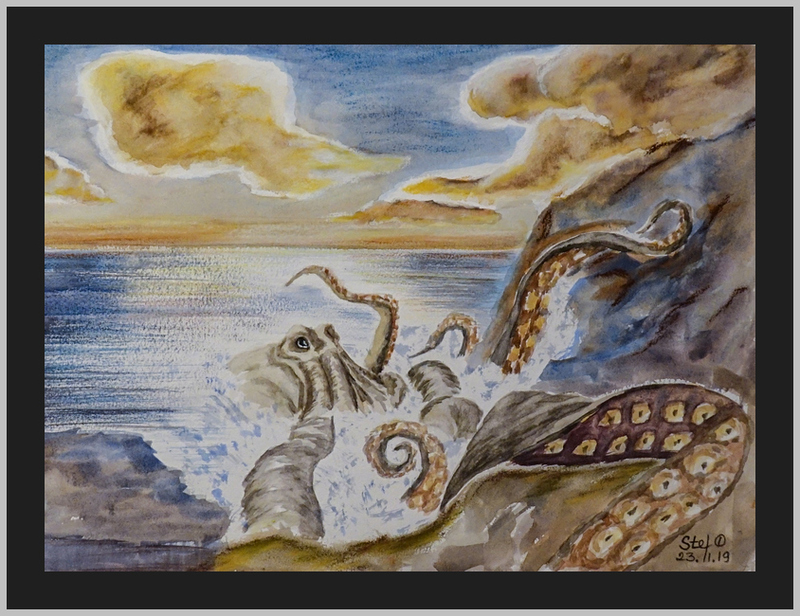 The digital Art @xpilar created is attached bellow, when I saw it I thought about a sea monster and here is my Painting and my little story, that I called “Gravity”. That is my first ever story and I hope you like it. The original comment you can see under the @xpilar post, unbelievable it was 11 months ago!!! …It is possible evening hours of the day on lonely island of volcanic origin. It seems that nobody lives on island the only inhabitant is a sea monster who knew that waters very well and lived there years but one day after an earthquake and underwater volcano eruption that strange rocky island appeared just in the middle of endless water. The monster decided to explore it, he never had a change to be really on the air, he even did not know if he can breath outside of water. So one day he slowly started to climb on the rocks initially very cautiously as he was in unknown territory, once he was a half way out it was a tremendous power forcing him to ground, it was nobody around but only him, he just wanted to know who is stronger and was fighting against it, he brought all his tentacles out and raised his body, the power eased up, he did not know that it was a power of gravity. But he felt himself stronger, he conquered the unknown land. Day to day, he liked to come and visit this rocky place, once when he was on the land enjoying the beauty of sunset, he felt that the ground started to shake, he knew what does it mean, it was more powerful than him and the gravity. He tried to hurry up back to water, but his body was too heavy and he was too slow. Another eruption of volcano brought fire and heat of lava that reached the monster. Cold pressed watercolor textured paper 30×40 cm, paper weight 300 gsm, watercolors colors in pans and tubes, flat and round brushes.